Medieval Cookbooks: Something to Inspire the Medieval Cook in all of us! We don’t usually think of haute cuisine when we think of the Middle Ages. But while the poor did eat a lot of vegetables, porridge, and bread, the medieval palate was far more diverse than commonly assumed. Meat, including beef, mutton, deer, and rabbit, turned on spits over crackling fires, and the rich showed off their prosperity by serving peacock and wild boar at banquets. Fish was consumed in abundance, especially during religious periods such as Lent, and the air was redolent with exotic spices like cinnamon and pepper that came all the way from the Far East. In this richly illustrated history, Hannele Klemettilä corrects common misconceptions about the food of the Middle Ages, acquainting the reader not only with the food culture but also the customs and ideologies associated with eating in medieval times. Fish, meat, fruit, and vegetables traveled great distances to appear on dinner tables across Europe, and Klemettillä takes us into the medieval kitchens of Western Europe and Scandinavia to describe the methods and utensils used to prepare and preserve this well-traveled food. The Medieval Kitchen also contains more than sixty original recipes for enticing fare like roasted veal paupiettes with bacon and herbs, rose pudding, and spiced wine. Evoking the dining rooms and kitchens of Europe some six hundred years ago, The Medieval Kitchen will tempt anyone with a taste for the food, customs, and folklore of times long past. According to food historian Segan, we inherited much of what we now think of as “American” food from the English: “The Pilgrims who arrived at Plymouth Rock were Shakespeare’s contemporaries and they brought their cookbooks from England.” Updating dozens of classic Elizabethan recipes, Segan leads a culinary foray into Shakespeare’s time. Each recipe is supplemented with a historical note that places the dish in context. For instance, Individual Meat Pies with Cointreau Marmalade were served by vendors catering to the theater crowd. The recipes have been adapted for the modern kitchen: all references to cauldrons have been removed. Section titles are in period English (Kickshaws instead of Appetizers, Fysshe instead of Fish, Pottage instead of Soups), but Renaissance scholars are not the only readers who will get a kick out of this book. Its playful tone, fascinating side-notes, and apt citations from the Bard’s plays make this book as fun to read as it is to cook from. And for the person who spends time in the kitchen hoping to satisfy curiosity as well as appetite, recipes like Lemony Sweet Potatoes with Dates and Lobster Tails with Wildflowers are sure to appeal. The approach to cooking is entirely practical. The emphasis of the book is on making medieval cookery accessible by enabling today’s cooks to produce authentic medieval dishes with as much fidelity as possible. All the ingredients are readily available; where some might prove difficult to find, suitable substitutes are suggested. While modern ingredients which did not exist in the Middle Ages have been excluded (corn starch, for example), modern time and energy saving appliances have not. Authenticity of composition, taste, and appearance are the book’s main concern. Unlike any other published book of medieval recipes, Pleyn Delit is based on manuscript readings verified by the authors. When this was not possible, as in the case of the Arabic recipes, the best available scholarly editions were used. 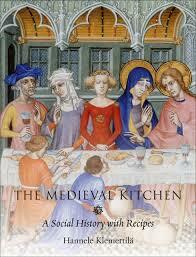 The introduction provides a clear explanation of the medieval menu and related matters to bring the latest medieval scholarship to the kitchen of any home. Pleyn Delit is a recipe book dedicated to pure delight – a delight in cooking and good food. Vinegar and sugar, dried fruit, rose water, spices from India and China, sweet wine made from raisins and dates—these are the flavors of the golden age of Arab cuisine. This book, a delightful culinary adventure that is part history and part cookbook, surveys the gastronomical art that developed at the Caliph’s sumptuous palaces in ninth-and tenth-century Baghdad, drew inspiration from Persian, Greco-Roman, and Turkish cooking, and rapidly spread across the Mediterranean. In a charming narrative, Lilia Zaouali brings to life Islam’s vibrant culinary heritage. The second half of the book gathers an extensive selection of original recipes drawn from medieval culinary sources along with thirty-one contemporary recipes that evoke the flavors of the Middle Ages. Featuring dishes such as Chicken with Walnuts and Pomegranate, Beef with Pistachios, Bazergan Couscous, Lamb Stew with Fresh Apricots, Tuna and Eggplant Purée with Vinegar and Caraway, and Stuffed Dates, the book also discusses topics such as cookware, utensils, aromatic substances, and condiments, making it both an entertaining read and an informative resource for anyone who enjoys the fine art of cooking.